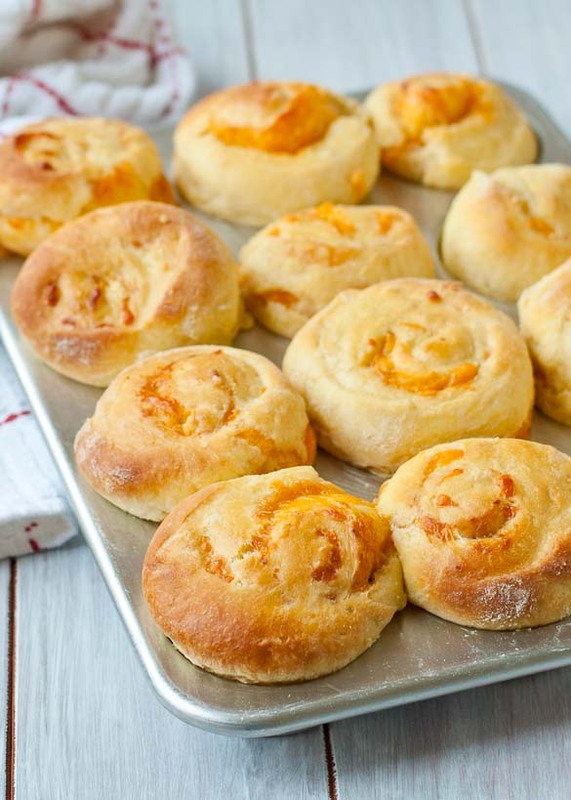 Supremely tender and fluffy Garlic Cheddar Swirled Brioche Rolls made the 10 minute, no knead way! It seems I have a moment with every experimental recipe when I’m positive things won’t work out. For this bread, it happened almost immediately. This brioche recipe comes from the totally genius Artisan Bread in 5 Minutes a Day website. If you haven’t heard of ABin5 (because honestly, who has the time to write that out? ), it’s a specific way of making bread which requires only 5-10 minutes of prep time and a long rest to get flavorful, fluffy bread every time. There’s no kneading and no proofing the yeast. You literally just throw everything into the pot, stir, then let the dough rest in your refrigerator for up to 5 days. I’ve had great success with the basic no knead bread recipe, but I was craving something a little more special for our Easter dinner this year. And nothing says special like brioche. Brioche is a rich, fluffy bread made with an amount of butter and eggs you’d be better off forgetting as soon as you taste it. In other words, it’s splendid for the holidays. Other than whisking up your eggs and melting the butter, this recipe is really no harder than the original ABin5. 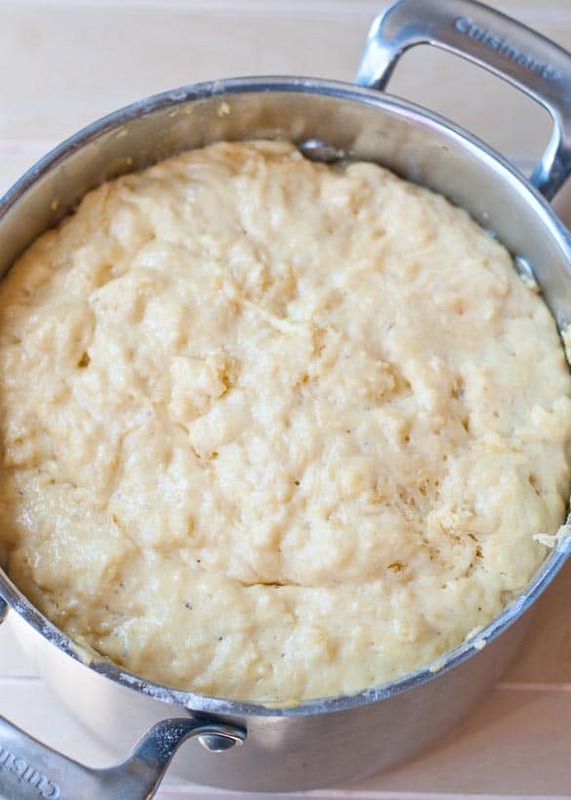 You simply stir together the yeast, water, salt, eggs, and butter then slowly stir in the flour until a dough forms. It was as I stirred in the flour that I had my moment o’ panic. This dough could only be described as strange. Lumpy, wet, and clumpy, I took one look at it and immediately decided it was never going to turn out. But I couldn’t bring myself to throw away 8 eggs and 3 sticks of butter (yep, you read that right!) so I stuck the batter in the fridge anyway and waited. Whaddaya know, the darn thing rose. It was still all kinds of strange, but I decided to roll it out and cover it in cheese and garlic anyway. Cheese and garlic can cover a multitude of sins. That’s what I always say. 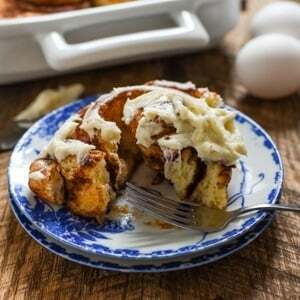 The dough got rolled up cinnamon roll style, cut into pieces and laid in a muffin tin. I put it in the oven, held my breath, and waited once again. After 10 minutes, the kitchen filled with the smell of yeast and garlic. Maaaaaaybe this was actually going to work. After 20 minutes the bread was pillowy and golden, with a lovely swirl of cheddar. Still disbelieving, I had to eat one straight out of the oven. 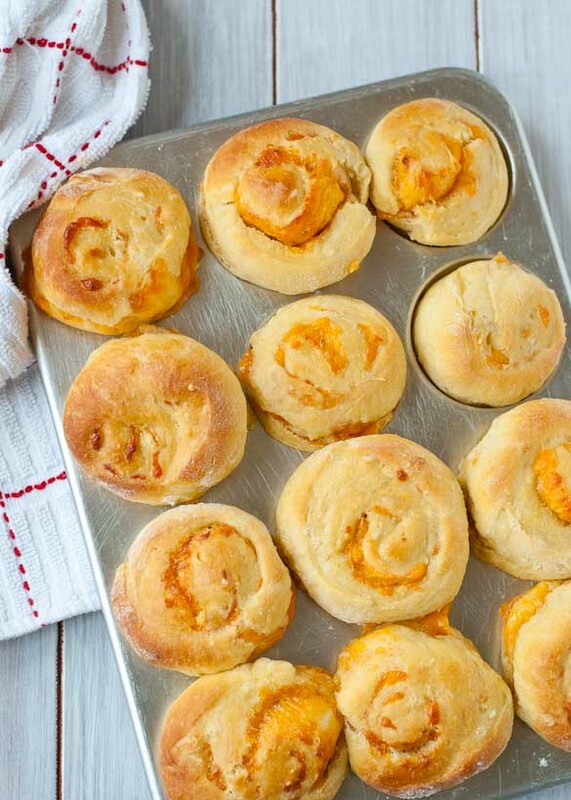 The dough flaked apart in glorious swirls, revealing the cheesy centers. It was tender and light, better than I ever imagined. I’ve talked before about my belief that bread baking is an exercise in faith. It’s still a mystery to me that such simple ingredients–flour, salt, yeast–can create something so deeply satisfying. The risen loaf is an everyday reminder that grace is still active, still moving in the mundane workings of my life. It tells a tale of hope, even when we’re waiting. Even when we doubt. Even when we can’t see how the lumpy, bumpy mess of our lives could possibly be redeemed. Easter is a beautiful time to reflect on Jesus’ death and the miracle of resurrection, but I fear our reflection often begins and ends on a single day, when really, resurrection is happening all around us. Jesus is present, living among us, breathing life, restoring souls, bringing rest to the weary and justice to the oppressed. Even when things look like a hot mess, He is here. As Tony Campolo famously said, “It’s Friday, but Sunday’s coming.” Resurrection is just around the corner. It may sound silly, but sometimes I need a simple yeasted bread to remind me Jesus is still in the business of taking this scraggly, jagged, broken world and making something beautiful. Let’s grab the butter and eat to that. In a large 5 quart bowl or pot, mix together the water, yeast, salt, eggs, honey, and melted butter. Add the flour and use a wooden spoon or sturdy spatula to stir the mixture together until the flour is incorporated. 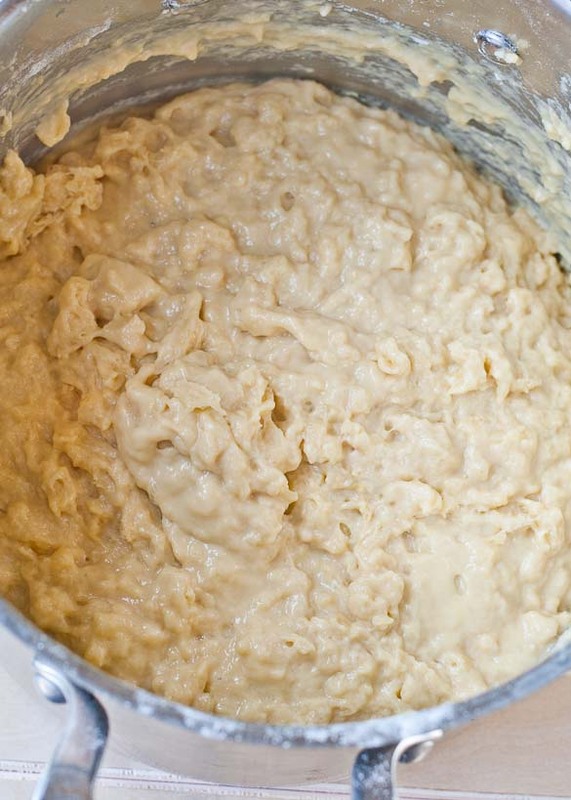 The mixture will be lumpy and will likely be wetter than other bread doughs you've worked with before. Cover the pot loosely and set in a warm place to rise for 2 hours. It should double in size. After 2 hours, place the loosely covered pot in the fridge and refrigerate for 2 hours or up to 5 days. When you're ready to make the rolls, generously dust a counter top or other flat surface with flour. Remove about 1/3 of the dough (I'm not real precise here. I've done it with nearly half of the dough. It works just as well, but you'll have mondo sized rolls). Place it on the floured counter. Sprinkle the top of the dough and your hands with flour. Use your hands to press the dough out into a roughly 10 x 16 inch rectangle (Again, I'm not ultra precise here). Sprinkle the dough with garlic powder then spread the minced garlic evenly over the rectangle. 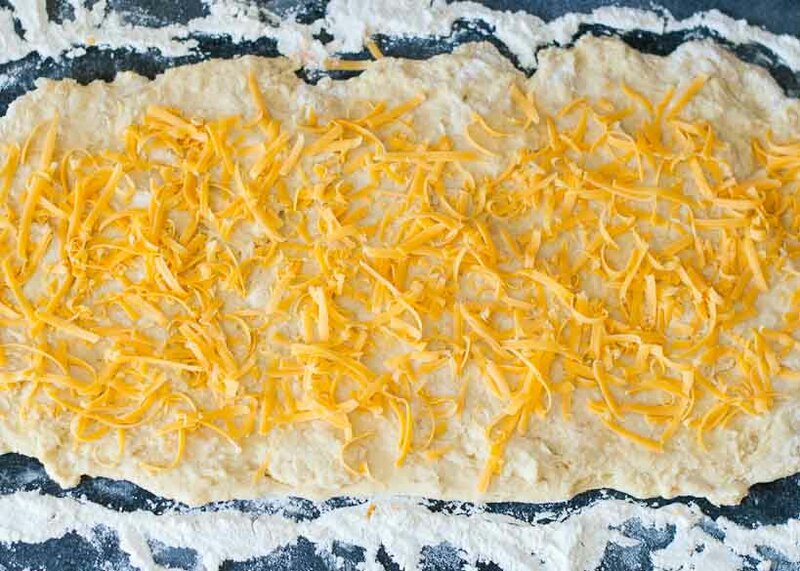 Sprinkle with cheddar cheese, leaving a 1/2 inch border. Roll the dough up jelly roll style starting on the long end. Slice it into 12 even pieces. Spray a 12 cup muffin tin with cooking spray. Place a slice of dough into each muffin cup with the sliced edge facing up and down. 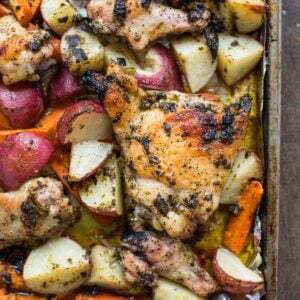 Cover the tray with a clean kitchen towel and let it rest for 60-90 minutes. Be sure to check out all my friends lovely #SundaySupper recipes celebrating Easter and Passover! I’m swooning from gazing at all of the beautiful breads for the Easter/Passover Feast, and your bread just makes me swoon more. I see what you mean about the swirls–yes, it had to be part of the name! Lovely! Wow, these look crazy good! Happy Easter, Courtney!!! YUM!!! I am so loving you recipe! It’s beautiful and the cheese, oh yah now that is what I am talking about! You and me both. 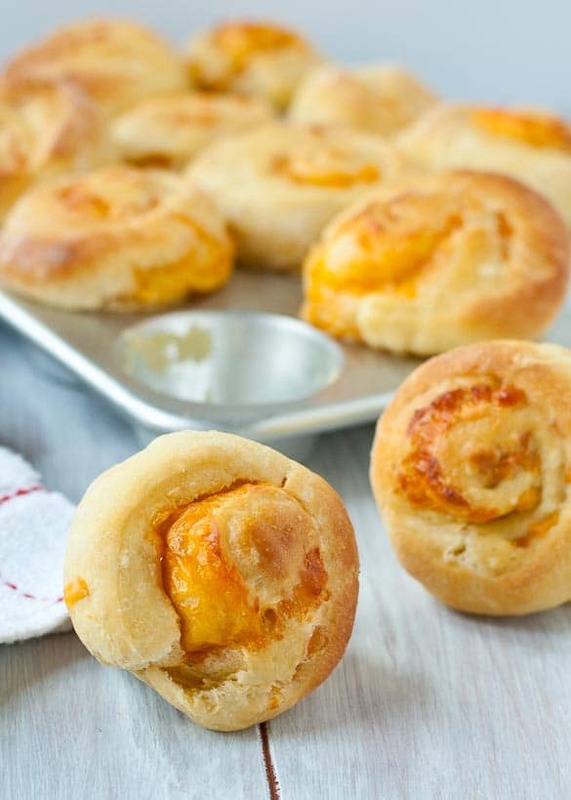 Who can resist swirls of cheese?! WOW! This look absolutely amazing! I will definitely be trying these very, very soon. Your “rectangle” looks perfect to me! Those would be great with a big bowl of the carrot/sweet potato soup I have made for Easter!! Oh yes they would. That soup sounds wonderful by the way! Nice save, Courtney! This bread looks delicious! Wow, these look so awesome. And easy! Happy Easter! So true. You never know what you might come up with! I MUST pin this and plan to make next Easter (or maybe Thanksgiving). They look fabulous! I’m glad the post had special meaning for you. 🙂 It was a special post for me as well. As far as the rolls go, yes, you put them in the fridge after letting them rise for 2 hours on the counter top. I let mine sit in the fridge overnight before rolling them out, but you can leave them for up to 5 days if you want! Fantastic post – you are right: bread & faith are the perfect parallel. Everything about your recipe is right up my alley — I love your flavor combinations and I wish I had one of these right now! Happy Easter! Thanks Jennifer! I wish I could share one with you! Giiiiiiiiirrrrrlllllll! I always love your posts so much and this one is so special. Baking anything, but bread especially, is definitely an exercise in faith. You throw everything in and cross your fingers, hoping it will turn out exactly as you had imagined. These are so fabulous. I LURV them! Happy Easter to you and your family, Courtney. Well thanks girl! I knew you’d appreciate big cheesy buns! 🙂 I hope you had a fabulous Easter! oh my gawd, love these brioche rolls!! 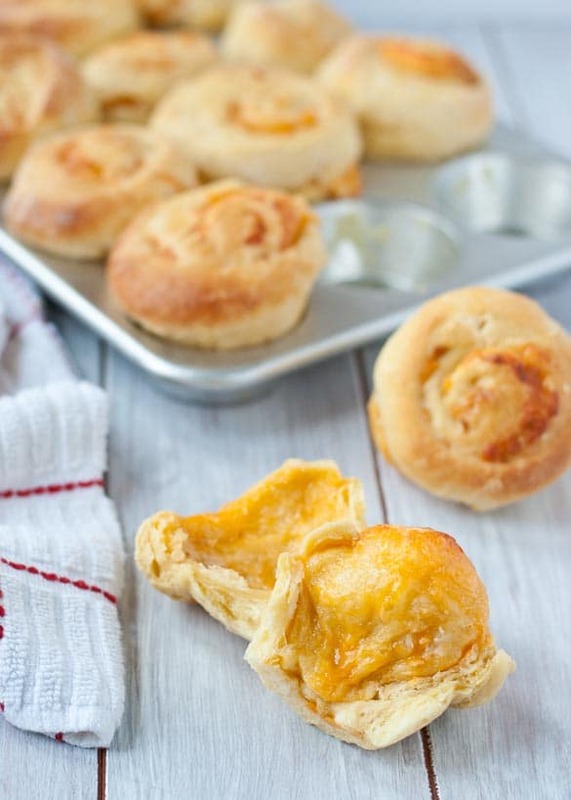 fluffy Garlic Cheddar Swirled Brioche Rolls made in 10 minutes?! I’m sold! and they look delicious! Happy Easter! These look perfect for brunch! Perfection!!! I love cheesy bread. You pulled it off!! They look incredible too! I love that you stick them in a muffin tin! These look absolutely AMAZING! Garlic, cheese and bread? Yep, I’ll be right over! These rolls are great and I love that you showed me the pics as you went along…trepidation and all! What do they say about the ugly duckling? These rolls turned into gorgeous swans. Awesome step by steps (I know those are tough!) and I love all the cheesiness happening inside of these. 10-15 min of work? Sign me up! No kneading? Count me in! And what a perfect combination of flavors. Yum!